On the eve of the day when the fictional Marty McFly went back to the future in “Back to the Future II,” Stanford University’s automotive lab unveiled its own MARTY, a heavily modified DeLorean car capable of drifting – maintaining sideways motion while traveling in a circle – without a driver. The project is part of Stanford’s ongoing research into automotive safety and autonomous driving systems. MARTY, which stands for “Multiple Actuator Research Test bed for Yaw control,” was unveiled at Stanford Tuesday evening, with a panel featuring the project’s collaborators and hosted by Jamie Hyneman of “Mythbusters.” After airing a video (embedded below), MARTY rolled out of its trailer amid lights and fog. 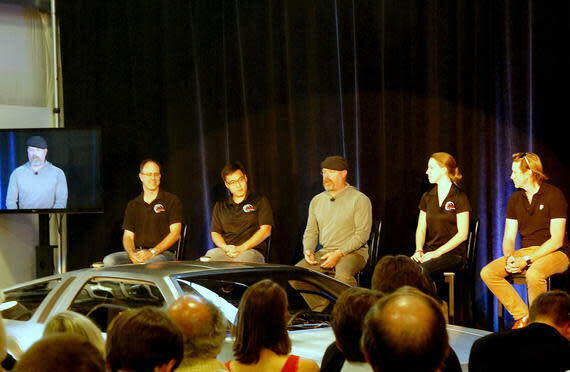 Hyneman appeared on stage with Stanford professor Chris Gerdes, students John Goh and Shannon McClintock, and Chris Heiser of Renovo Motors, the company that supplied the electric drive components for the project. During the discussion, Gerdes pointed out that drifting, while entertaining, is not the fastest way to get around a turn. However, it works as a tool that autonomous cars could use to avoid accidents. The point of MARTY is to explore how autonomous cars can maintain control at the limits of handling. In the demonstration video, MARTY is able to hold its intended course in a minimal grip situation, just like a human drift driver. In fact, MARTY showed a level of car control beyond the average human driver. Hyneman dug into the technical details of MARTY’s propulsion system with Heiser, including the dual rear motors allowing precise torque control at each rear wheel. Heiser pointed out that the power control possible with this dual electric motor configuration is impossible with a gasoline-engined car. MARTY is built on a 1981 DeLorean DMC-12, the iconic car used in the “Back to the Future” movie trilogy to travel through time. Goh, McClintock and the rest of the Stanford team were faced with removing the DeLorean’s engine and transmission, replacing its steering rack with an electric power steering system, and tweaking the suspension so that it could actually drift, something the team admitted the original DeLorean could not do. As to why the team built MARTY on a DeLorean, Goh said the team wanted to avoid using a car from a major automaker, and were looking for a rear-wheel-drive, mid-engine platform. The DeLorean fit those parameters, but mostly had the right kind of panache for the project.